ATHENS (Reuters) - Finance Minister Yanis Varoufakis acknowledged that a deal to ease Greece's cash crunch was not likely at a meeting of euro zone finance ministers later on Monday despite progress in talks with lenders on some issues. Greece is under growing pressure to reach agreement with lenders to avoid financial chaos though many Greeks also want the government to stick to its "red lines" of avoiding further pension cuts and labor reforms making it easier to fire workers. A 750 million euro debt repayment to the IMF falls due on Tuesday but Varoufakis said a deal that would provide some liquidity relief for Greece was more likely in the coming days. "Τhe likelihood is not ruled out. The messages we are getting are that it will be difficult," Varoufakis told Sto Kokkino radio on Monday. 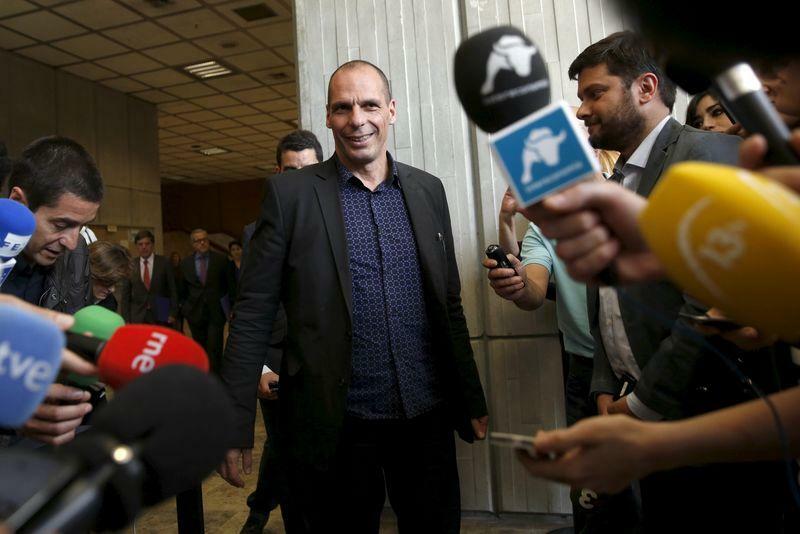 Varoufakis, who will take part in the meeting, said the two sides had converged on many issues. "The Greek government is struggling in a very tough negotiating fight to achieve an agreement that will not only be an agreement to have a disbursement (of aid) but one that will deliver a substantive hit to the crisis," he said. "I think the solution will be given in the coming days and not necessarily today. We will do whatever we can to achieve (liquidity) relief today." Euro zone officials have ruled out a deal with Greece at Monday's meeting and said any statement they make is unlikely to be enough to allow the European Central Bank to raise the limit on short-term Treasury bills that Greek banks can buy - a move Athens has sought as a way to avert a national bankruptcy. In a sign of growing pressures within the ruling Syriza party against backing down to lenders, the parliament speaker Nikos Filis suggested on Monday that the IMF debt repayment would depend on the Eurogroup outcome. The stance of Filis, a hardliner within Syriza, is different from that of the government, which says it will make the payment on Tuesday. "It is clear that any move by one side affects the other side. The next moves will be shaped by today's developments, we are seeking an agreement," Filis told Mega TV. "The decision (on the IMF repayment) will be taken today. It depends on the Eurogroup," he said. A Marc poll for Ton Syntakton newspaper on Monday showed that 76.9 percent of Greeks want the country to stay in the euro zone with only 19.2 percent saying they favor a return to the drachma. If negotiations with lenders hit an impasse, 51.1 percent said the leftist-led government should continue to govern, 22.8 percent favored a referendum on what the government should do if there is no deal and 16.6 percent wanted elections.